Essential oils are a paradise for the senses and provide many health benefits. Essential oils ease the mind, diminish the stresses of life and take the body on a relaxing journey. They energize and promote positive moods. Therapeutic-grade essential oils are a great giveaway for spas, fitness gyms, chiropractic offices, massage centers, private clinics, treatment centers, hotels and more! These oils have a value-added benefit of showing “care for customers” and are a unique gift from realtors, financial institutions, insurance agents, non-profits, dance instructors, or any other professional service that appreciates customers! In addition, for any organization, essential oils encourage healthy employee habits. Essential oils are the perfect gift for massage therapists, homeopathic physicians, wellness consultants, specialists, fitness experts and more. These practitioners can also use these essential oils within their businesses as aromatherapy, stress relief, healing, fragrant perfume or simply dilute the oil with fractionated coconut oil and these promotional products can be used as massage oil. Using the same product you are giving away shows clients how much you believe in your choice of promotional products. Whether you are an event organizer, sponsor or participant, essential oils are a year-round giveaway that will not only benefit the event, but they will also benefit the recipient – and keep your brand in good health too! Imagine healthy marketing “tools” at prevention seminars, health fairs, nutrition events, health-related conferences, safety awareness classes, wellness workshops, practitioner meetings, community nights out or a goodie bag insert for any women’s-themed seminar. Customized essential oils are an incredible way to help attendees feel better mentally and physically while promoting your brand. ePromos has these unique, wellness-enhancing, therapeutic oils that come in a 15ml Bottle with a twist-off cap and dropper for applying the oil. The bottles have a 1.5”x.75” imprint area on the label for your company’s crisp, full color logo or marketing message. An option is to add individual display box packaging with a clear-view cover. Easily apply oils with less mess using a 10 ml. Rollerball Bottle. Available in every aroma. PEPPERMINT promotes healthy respiratory system. No tint. LAVENDER is a soothing aroma that’s known to help encourage a serene atmosphere. No tint. TRANQUILITY relaxes the mind and body by combining Lavender & Chamomile, plus marjoram, ylang ylang, sandalwood, vanilla, cedar and lemon. No tint. EXHALE, as the name suggests, promotes clear respiratory function using mostly Eucalyptus & Peppermint. Laurel, peppermint, tea tree, eucalyptus, lemon and ravensara. No tint. CLOUD9 consists of Lemongrass & Sandalwood, with touches of lavender, tangerine, elemi, bergamot, ylang ylang and cedar. 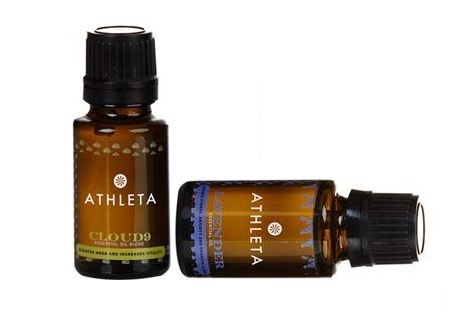 Look to Cloud9 to elevate the mood and increase vitality. Oil has an orange tint. LEMON: is Lemon only. Health benefits that range from healthy hair to an immune system boost. Oil has yellow tint. IMMUNITY: Orange, Clove & Lemon…The clean scent not only smells great, but also boost the immune system. Grapefruit, mandarin, patchouli, clove, cinnamon, eucalyptus, and rosemary. Oil has a yellow tint. INVIGORATE is a combination of Grapefruit & Vanilla and this combination energizes and positively affects mood, taking away all the day’s stresses. Orange, lemon, grapefruit, bergamot, tangerine, and vanilla. Oil has a yellow tint. FOCUS consists of Peppermint & Pine with touches of lavender…promotes balance, calmness and well being. No tint. The health benefits of these oils are never-ending and they are easy to use. They can be used through a diffuser for the power of health and wellness in homes, offices, wellness education centers, new mom reunions, healthy lifestyle meetings or parent consultations. Essential oils can be applied to wrists, ears, temples and back of neck. They can provide support for a healthy immune function and help relax your mind and body. Specific oil benefits may include relief from muscle aches, tension/everyday stresses, migraines, jet lag, exhaustion, heartburn and even bug bites! Add a few drops to your bath water to make an immunity boosting spa experience. Essential oils have many additional uses. They can be used to freshen your kitchen, bathroom, carpets, bed linens and laundry. Or, just add a few drops of essential oils on a cotton ball and place it under the seat of your car for a refreshing smell. Use a few drops of Peppermint essential oil on a cotton ball to repel unwanted houseld pests (like mice or spiders) just as effectively as harsh, foul-smelling pesticides.